Thank you very much for subscribing to SCUBA News. Ever thought of volunteering with a Great White Shark project? Read about it in a fascinating article below by Bill Mashek. Also in this issue, we are pleased to announce our list of the bestselling diving books and DVDs of 2014. Last month's interviewee, Beth Tierney, has two entries in the list this year: Diving the World (which has just been re-issued) and Diving Southeast Asia. See below for the rest of the most popular SCUBA books. You can download a pdf version of this newsletter. I hope you enjoy SCUBA News but should you wish to cancel your subscription you can do so at https://www.scubatravel.co.uk/news.html. SCUBA News is published by SCUBA Travel Ltd.
We are pleased to release this year's list of the best selling SCUBA books and DVDs. 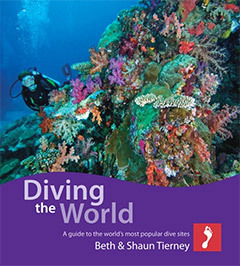 Dive Atlas of the World remains at the top: it has been continually in the list since 2003. The excellent Shipwrecks of the Egyptian Red Sea is a welcome re-entry after dropping out last year. Newcomer to the list is the UK Dive Guide. All the books (and the single DVD featured) are either diving or sealife guides. Diving novels, histories and memoirs have fallen out of favour. Here are the top ten: figures in brackets show the previous year's position. If we've reviewed a book, we link to the review. Otherwise the links go to the cheapest place we've found for you to buy the book. 9. 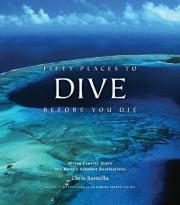 The World's Best Dive Destinations DVD. The Divers Bestsellers list is also available on the web site. The 1974 film "Jaws" immortalized the Great White but also did more damage to the image of the Great White Shark than they could ever do themselves. Despite all the fear and celebrity, very little is known about these aquatic behemoths. Scientists who have studied Carcharodon carcharias (jagged tooth) aren�t even sure how they reproduce. 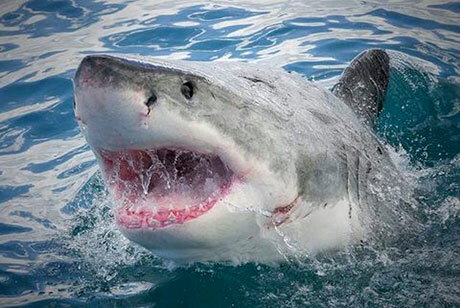 The legendary Great White Shark "man eating" mythology is more fiction than fact. They are apex predators, but not gratuitous killing machines. They need to be understood and respected rather than be feared. Great Whites are found Worldwide: cold water, temperate zones to tropical. They seem to prefer temperate coastal seas. Tagging Great Whites has given scientists an idea of their migratory patterns which can exceed thousands of kilometers. They will swim in shallow areas near shore or as deep as 250 meters. Great Whites are the world's largest predatory fish. They can grow up to 20ft (4.6-6.1 meter) and weigh more than 5000 pounds (2,268 kg). Great whites are carnivores. Their preferred diet is whales, sea lions, seals, sea turtles and carrion. People are not part of the Great Whites "culinary cuisine". Most incidents of so called attacks are curiosity bites. Sharks sensory organs are around their mouth and they will often bite an object they are not familiar with and release it. They can sense a few drops of blood up to five kilometers away. Baby sharks (pups) are born live. They can be up to 1.5 meters at birth and immediately self-sufficient. The pup will leave its mother when born and has a natural instinct to hunt. Great Whites can live up to 70 years. I spent 15 days working as a volunteer at White Shark Projects in Kleinsbaai South Africa. This is an area known to have the highest concentration of Great Whites in the world and the best place to see them in their natural environment. All the people I met at Shark Projects, including volunteers, staff, and research scientists have a common endearment for sharks, especially the "elusive" Great White. Working as a volunteer was a profound experience. White Shark Projects works with "eco tourists" and local enthusiasts to help change many of the needless misconceptions as well as the slaughter of over 100 million sharks per year. After reading about White Shark Projects Volunteer program, I knew this was an experience I wanted to be part of. White Shark Projects was originally founded as a research center. 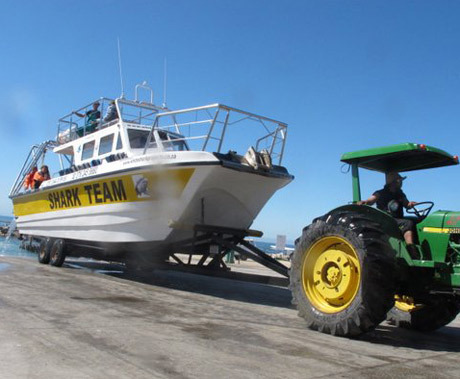 They have expanded as a shark cage diving company which works with the South African Shark Conservancy (SASC). Besides taking folks out on cage dives they also collect data on individual sharks, inclusive of: their size, gender, physical characteristics, migratory patterns, specific markings, tags, and behavior, i.e. curious, feisty, timid and even aloof. They pass this data on to SASC who analyze the information for scientific study. 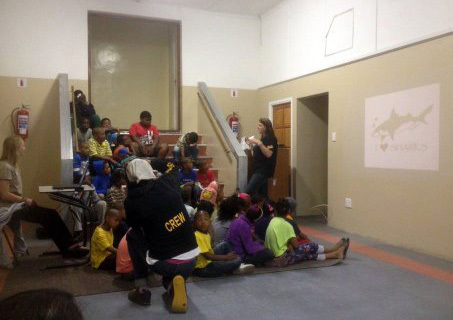 Being educated in shark biology and conservation, we went to local schools and an orphanage where we shared this information through presentations on these apex predators. Shark Projects supports South Africa Shark Conservancy (SASC) which is a shark research organization. 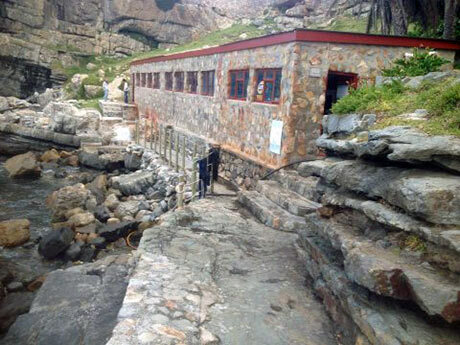 We spent one day per week at the SASC marine lab listening to lectures and doing field work. A typical dive day starts at 5:30 am when I got picked up at my guest house. We get all the wetsuits and equipment ready to load. Drive down to the dock and transfer these items to the boat. Some of us will go to the lodge and meet the participants and help them with life jackets and walk them to the boat. Prior to this the participants all meet at the lodge for breakfast and an introductory talk of what they are about to encounter. Some folks are experienced divers and underwater photographers; some never had their head under water. All have a shared curiosity of what they are about to experience. The fun begins when the first sharks appear. Volunteers go through extensive and continuous training including basic seamanship, how to get in and out of the cage and how to remain secure and safe once inside. We learned about data recording, shark tourism, working with clients, and vigilant shark spotting. Some of the training includes lectures on shark biology and habitat, conservation efforts, shark bite incidents, shark tourism and what to look for in recording data. We spent 2 days, free diving and catching leopard and cat sharks for SASC laboratory. They use these small harmless sharks for research and tagging. Because of unpredictable ocean conditions, on non-dive days, volunteers will often go on nearby excursions or get involved with the local culture. Shark Projects has set up a recycle program, in the community appropriately named, The Swap Shop. The Swap Shop is a place where the children who bring in recyclable items and trade them for points. They can then use these points to purchase school supplies, toys, clothes, and other items. This program promotes recycling and environmental awareness and well as supplying some basic needs for the children. This is an enriching cultural experience for volunteers. We've added a "Tweet This" link to our news items this month. Let us know if you find it useful, or if you would rather it wasn't there.